November | 2013 | Mommy. Foodie. Athlete. My husband and I compliment each other perfectly in every way! Just one of the many examples is that I cook and he bakes, which means we can pull off one hell of a dinner feast. For this year’s Teacher. Foodie. Athlete. Does Thanksgiving, he is obviously in charge of the desserts. This is his awesome twist on an American classic! 1. Make filling by tossing apples, orange juice, sugar, flour, cinnamon, cloves, ginger, and salt in a large bowl until apples are well coated. 3. Make the crust by Mixing flour and salt in a medium bowl. Cut butter into small pieces and add to flour. Cut butter into flour with a pastry blender until the mixture looks like coarse crumbs. Stir half of the water into flour mixture with a fork. Keep adding water until dough sticks together. Divide dough in half. Roll one half of dough into an 18″ circle. Place into a pie dish. Roll second half of dough into a 16″ circle. 3. Add apple filling to pie dish. Cut the 2 tablespoons of butter into several pieces and distribute on top of apples. Place top crust on top of apples in pie dish. Trim excess crust with a knife. Using thumb and forefinger press top and bottom crust together in a fluted pattern. Pierce top crust with a fork in about 10 random places. Bake pie on middle rack of oven for 60 to 70 minutes. 4. 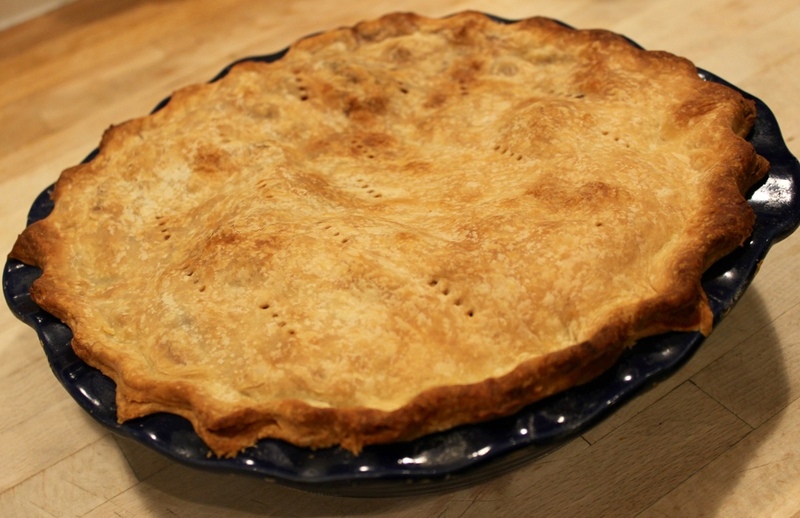 If crust begins to brown early lay a sheet of foil loosely over pie. Even though your turkey will be so deliciously moist after following this recipe, gravy is the cherry on your thanksgiving sundae! This recipe is my mother’s and it is perfect! 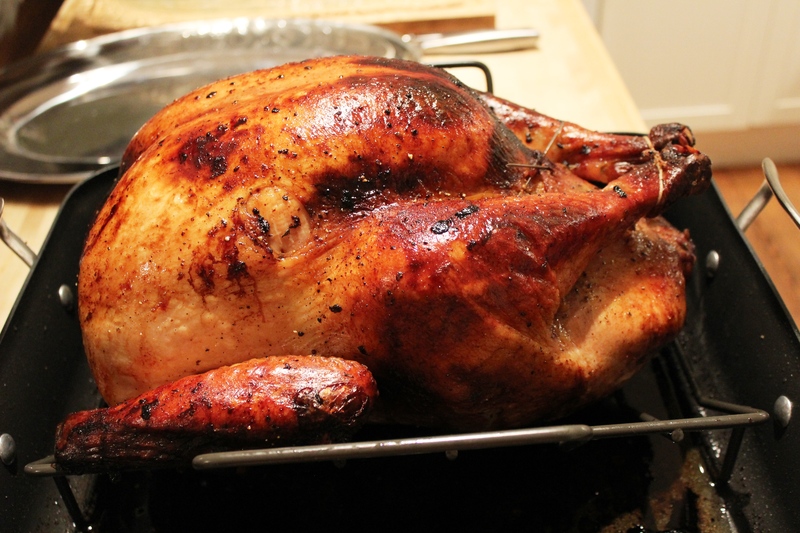 Make it the day before and then reheat and combine with turkey drippings on Thanksgiving Day! Please enjoy all of my Turkey Day recipes as a part of my Teacher. Foodie. Athlete. Does Thanksgiving! 1. In a large sauce pan, bring water to a boil and add salt, onion, celery, and turkey “parts”. Boil until it reduces to half. 2. Remove turkey parts. Mince all meat and remove bones/cartilage. Return meat to gravy and set aside until roast turkey is done. 3. After removing turkey from oven, remove turkey from roasting pan and set aside to rest. Pour gravy directly into pan with turkey drippings. 4. 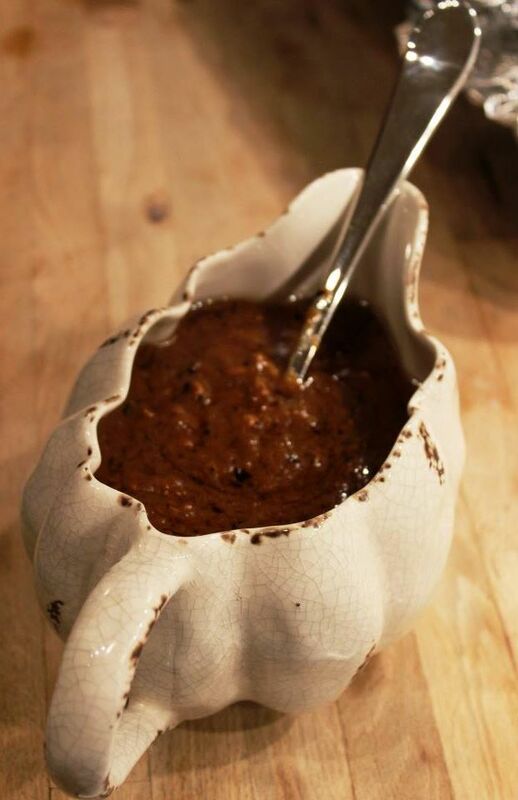 In a small bowl whisk together flour and a full ladle of gravy. Add back to pan. 5. Put turkey pan directly on your stovetop and heat over medium high heat (use 2 burners if big enough). Whisk gravy until it thickens. Serve it piping hot! Every family has one. 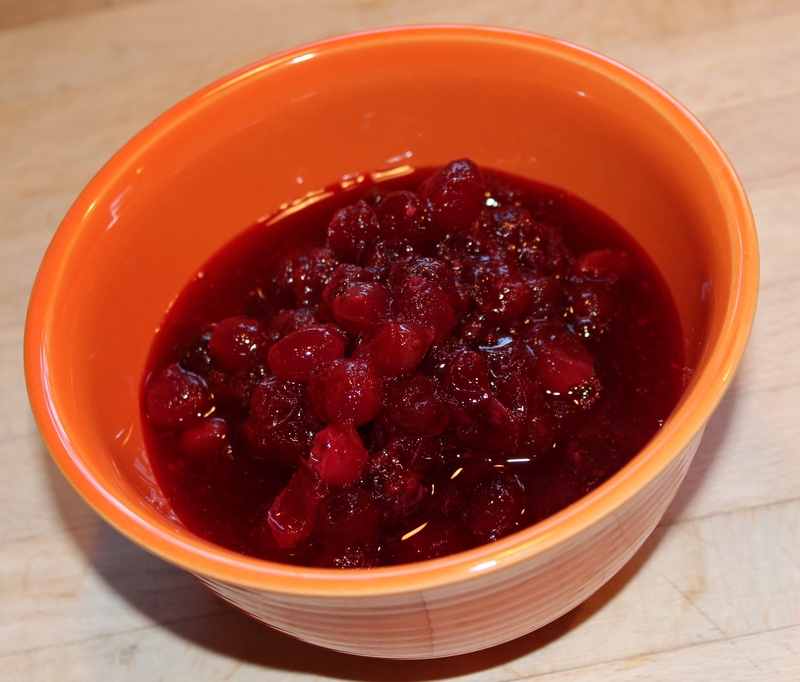 The person that needs the canned cranberry sauce, even after you put in all that hard work and love preparing Homemade Cranberry Relish! 2. Jiggle and convulse to remove said gelatinous log from can. 3. Serve on a plate. Cut a few precut slices to entice your guests. I like to overdo things, so for Teacher. Foodie. Athlete. Does Thanksgiving instead of just doing one veggie I am doing two. It’s always nice to give your guests options. This is so quick and easy that you can throw it all together in the pan early in the day, and then just cook it in the last 10 minutes before dinner time! I will cook while you carve the turkey! 1. In a large skillet, heat olive oil over medium high heat. 2. Add asparagus, garlic, and salt and pepper. Cook for 10 minutes or until asparagus is tender. 3. 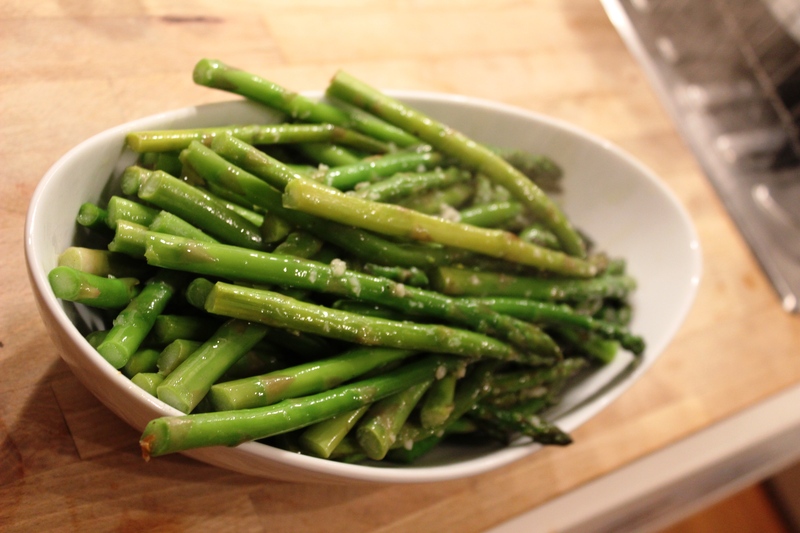 Pour lemon juice over asparagus, toss, and serve. I don’t know why brussel sprouts got their terrible reputation, but man do I love them! It’s funny, you make them for Thanksgiving one year and you totally find out that your family members are closet brussel sprout lovers! 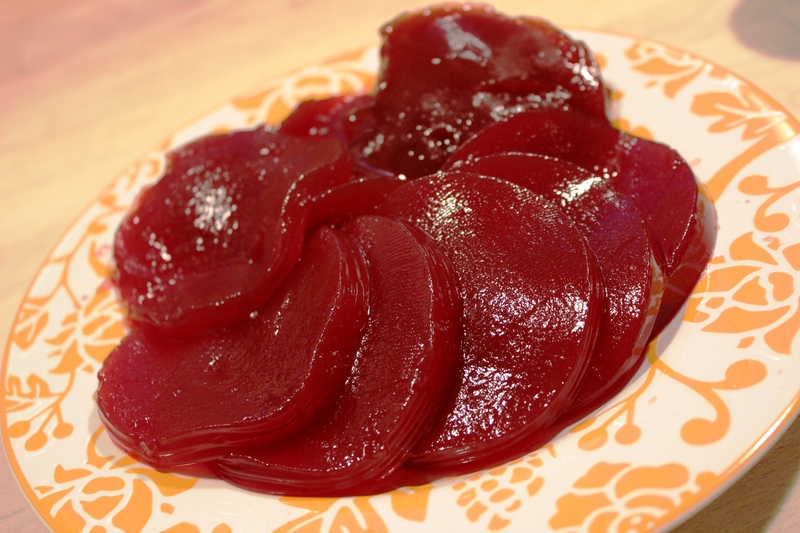 This recipe is so incredibly easy and is designed to cook in harmony with your turkey. Once the bird is out and resting, you give these little delectables a blast of heat to cruch them up. I will be making them as a part of my Teacher. Foodie. Athlete. Does Thanksgiving series… Will you? 1. Preheat oven to 325 (turkey roasting temperature). 2. In a large baking dish, mix all ingredients. I don’t usually use much salt in my cooking, but I do here! 3. Roast for 30 minutes (time it so that when the 30 mins are up, the bird comes out). Once the turkey is out of the oven, crank it up to 425 for 5 minutes to crisp up the outer leaves. 4. 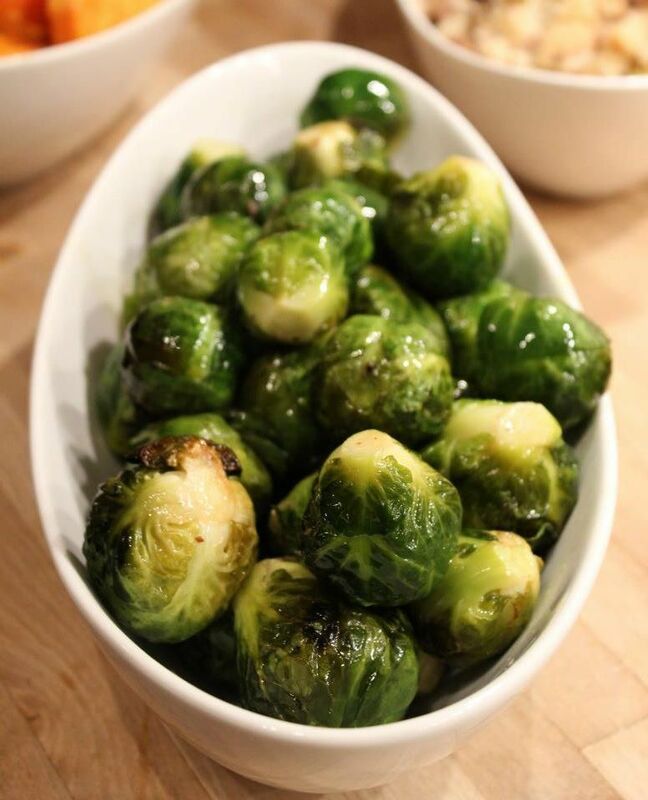 Serve and sit back knowing that you aren’t the only brussel sprout lover out there. You can get creative with Thanksgiving side dishes, by why on Earth mess with something that is so delicious on its own? Here is my candied yam recipe for my Teacher. Foodie. Athlete. Does Thanksgiving menu! 1. Preheat oven to 325 (turkey cooking temperature). Spread sweet potato rounds in a single layer in baking dishes (I use the shallow aluminum ones to allow more space in my Thanksgiving oven). 2. Cut butter into pats and place one on each round. Sprinkle with brown sugar and season with salt and pepper to your liking. I love the salty and sweet flavor! 3. 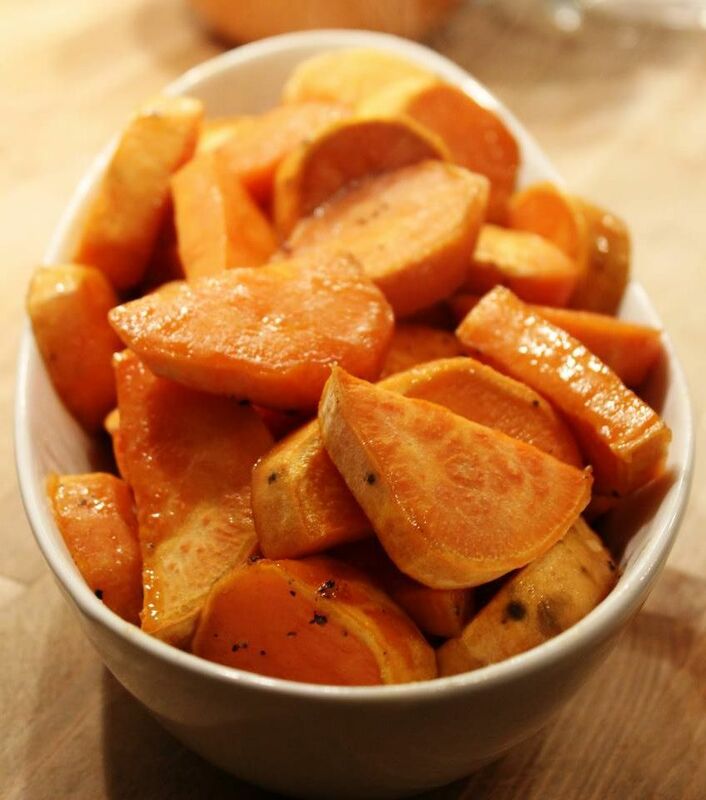 Bake for 40 minutes or until sweet potatoes are cooked through and tender. When you prepare the perfect Thanksgiving feast, you have to have all the fixings! This is so simple, and can be done the day before! Yes, there are those family members that will demand the gelatinous canned version with can rings and all, but this really does add a touch of sophistication to your meal! Check out what else I have up my sleeve this year on my Teacher. Foodie. Athlete. Does Thanksgiving post! 1. In a saucepan, heat sugar and water until boiling. Allow to boil for 5 minutes. 2. Add cranberries and stir. Bring back to a boil and let cook for about 5 minutes or until all cranberries have “popped” releasing their natural pectin to thicken. 3. Stir in orange zest and refrigerate for at least 3 hours before serving. As a part of my Teacher. Foodie. Athlete. Does Thanksgving series, we go above and beyond the minimum requirements for Thanksgiving dinner. Instead of just doing this perfectly roasted turkey, I also do a Cajun deep fried turkey. Growing up, we always had the typical stuffed roasted turkey. Don fix what isn’t broken, right? A simple brine makes the classic so moist, and sausage stuffing makes the perfect side! Stuffing – try this recipe for Sausage Stuffing! 1. At least 24 hours before roasting, heat all brine ingredients in a large pot over medium heat until brown sugar is completely dissolved. Remove from heat and allow to cool COMPLETELY. Place the turkey in a plastic bag (garbage bag works great!) and add the brine to the bag. Place bag in a large pot and pack with ice. Allow to rest for 24 hours while occasionally adding more ice as it melts. 2. When ready to roast, preheat oven to 325 degrees. Remove turkey from brine and thoroughly pat dry with paper towels. Loosely pack both cavities with stuffing. Do not cram in! Stuffing needs space to expand when cooking. 3. Truss the turkey, rub down with olive oil, and generously season with salt and pepper. Place on a roasting rack and pan, and roast for about 5 hours while occasionally basting. 4. About 3 hours through (or when skin is browned) cover loosely with foil to prevent over browning. 5. When the thickest part of the breast reaches 180 degrees and the stuffing reaches 165, remove the turkey and allow to rest for 15-30 minutes before carving. What is the point of a Thanksgiving feast without complete decadence? This cheesecake is the ultimate dessert! Yes, I don’t bake. Yes, I am a lucky duck to have married a man who does. I introduce to you, Pumpkin Bourbon Cheesecake! Please enjoy this and all of our other creations that are a part of Teacher. Foodie. Athlete. Does Thanksgiving! 1. Make the crust: Preheat oven to 350 deg. In a bowl combine the cracker crumbs, pecans, and sugars, stir in the butter, and press the mixture into the bottom and 1/2 inch up the side of a buttered 9-inch springform pan. Bake for 7 minutes. Cool the crust to room temp. 2. Make the filling: In a large bowl with an electric mixer cream together the cream cheese and the granulated sugar. Beat in the cream, cornstarch, vanilla, and bourbon. In a separate bowl whisk together the pumpkin, egg, cinnamon, nutmeg, ginger, salt, and brown sugar. Add pumpkin mixture to cream cheese mixture, and beat the until it is smooth. 3. Pour the filling into the crust, bake the cheesecake for 55 to 60 minutes, or until the center is just set. Cool in the pan on a rack for 5 minutes. 4. Make the topping: In a bowl whisk together the sour cream, the sugar, and the bourbon. 5. Spread the sour cream mixture over the top of the cheesecake. Return to the oven and bake the cheesecake for 5 minutes more. Let the cheesecake cool in the pan on a rack. When at room temperature, cover and refrigerate overnight. 6. 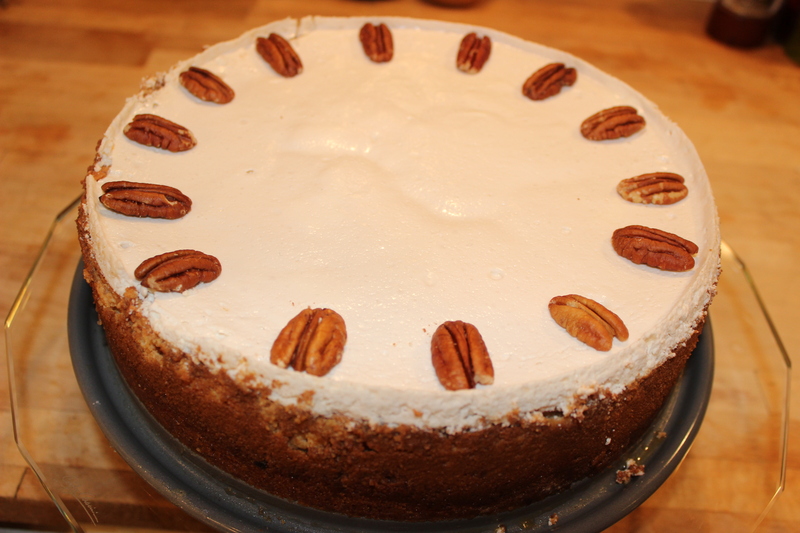 When ready to serve, remove the side of the pan and garnish the top of the cheesecake with the pecans.